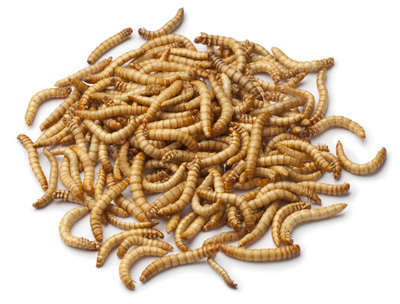 Mealworms are nutritious insects that are high in protein and fat. They are a good food for birds, reptiles, small animals, and even people. Although eating insects may sound strange, for most of the world eating insects is quite common. Some are even considered a delicacy. Mealworms can be eaten raw and alive, they can also be pan-fried, but dry-roasting is often the tastiest and least recognizable way to eat them. Dry roasting is a good way to store excess mealworms. Dried worms don’t take up much space and can last up to a year without being refrigerated. Roasting removes the moisture from the insects while retaining much of their protein and nutritional value. Dry roasted mealworms can be salted or dipped in chocolate and eaten as a snack, sprinkled on salads, and added to soup. They taste a lot like peanuts and can replace nuts in cookies, cakes, and other desserts. Since roasted worms are brittle, they can be ground and mixed with flour when you bake muffins, pancakes, or bread. The different ways these insects can be added to recipes is almost limitless. Place your live mealworms in a colander and toss and rinse them under cool water. This is to remove any food and substrate from the worms. Be sure to pick out any dead worms or pupae. Pat the worms dry with paper towels, place them in a container or plastic bag, and put them in the freezer for about fifteen minutes. This will quickly kill the worms. Spread the mealworms out evenly on a non stick cookie sheet. If you are worried that the worms may stick, you can lightly grease the sheet. Place the worms in an oven at 200 degrees and bake them for one to two hours until they are dry and crispy. Some people do not like the smell of baking worms and prefer to cook them outside on a gas grill set to a low temperature. NOTE: If you are roasting a large quantity of mealworms, you can use a roasting pan instead of a cookie sheet. They may also need to be baked for a couple more hours. Interested in cooking with insects? Check out these cookbooks.